Latest News “Riiap Raawy” for Elephant Research! From primates to elephants to primates to…elephants? As I begin a PhD program studying elephant behavior and cognition, I have been reflecting back on my research career. Five years ago I was getting my first taste of collecting systematic behavioral data on chimpanzees and gorillas as an intern at Lincoln Park Zoo’s Lester E. Fisher Center for the Study and Conservation of Apes. 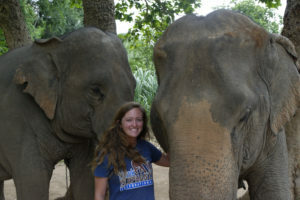 The internship solidified my interest in behavioral and cognitive research, which led me to seek out a research assistant position with Think Elephants International. During my year with Think Elephants in Thailand, I dove into the world of elephant cognition and learned the importance of taking an elephant’s perspective when asking them cognitive questions. 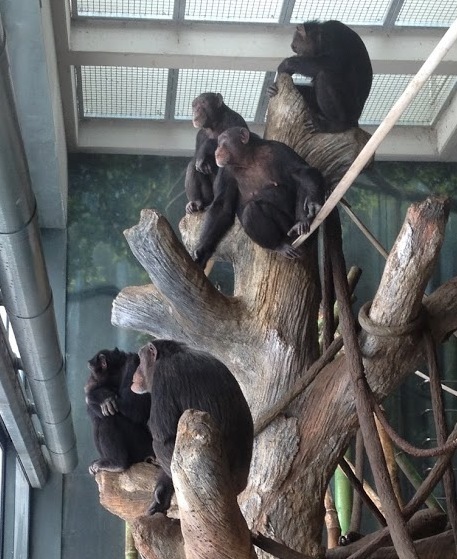 When the position ended, I returned to primates as a research assistant at Lincoln Park Zoo’s Fisher Center. For the past three years, when I presented macaques with touchscreen tasks or watched a gorilla manipulate a puzzle to receive a food reward, I thought about how an elephant would solve the task. I imagined the large scale device that would need to be created, how durable it would need to be to stand up to the force of a 5-ton body, and most importantly, whether it would even be appropriate to ask an elephant a question that relied on their vision. It may seem strange that my career has flipped back and forth between these seemingly very different species, but I have seen many similarities in my experiences in the past three years. Observing these similarities has shaped my interests as a researcher. As part of my position at the Fisher Center, I was fortunate to have the opportunity to ask primates questions using both physical puzzles and touchscreen computers. I provided our closest relatives, the chimpanzees and western lowland gorillas, with a puzzle that tested their cognitive flexibility and propensity to form habits when solving the task. Not only did the apes demonstrate impressive flexibility, but they also showed a lot of individual variation. For example, Azizi, an adolescent male gorilla was consistent and methodical, while Kathy, an adult female chimpanzee chose whichever method struck her fancy for each trial. Some of the apes even used their mouths to solve the task, while others used their hands as we had expected. Variation in individual personalities and how it was reflected in each subject’s learning process was also something I observed in our elephant subjects at Think Elephants. Some elephants made careful selections with their trunks while others were impulsive and impatient to receive their rewards. To investigate learning in our more distant relatives, Japanese macaques, I used touchscreen computers. 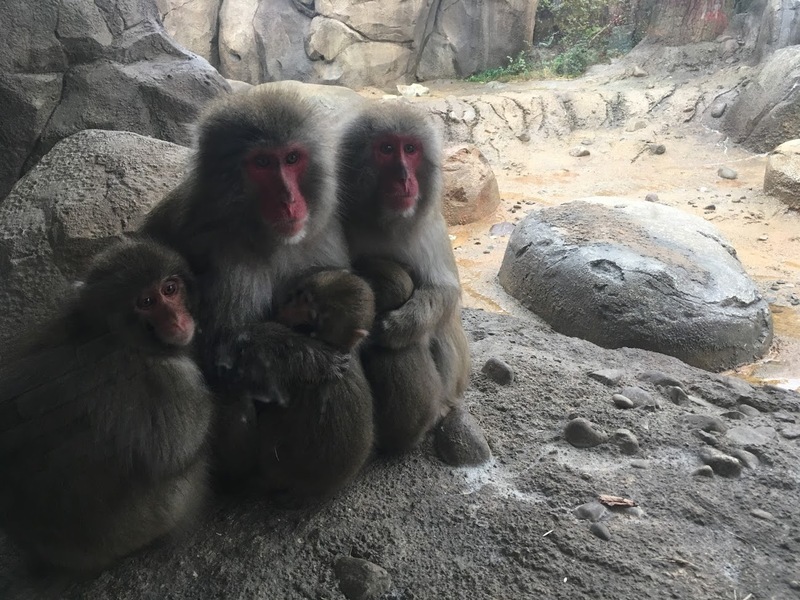 The macaques could voluntarily enter a touchscreen computer booth and touch colored dots in a particular order to receive a delicious treat. Over the three years that they were given this task, babies were born and watched their mothers use the touchscreen, then impressed me with how quickly they learned the correct color order when they were independent of their mothers. This type of social learning was not something that I had the opportunity to observe in my experiences with the elephants at Think Elephants, but I would expect it to occur with this social species. Both primates and elephants form strong social bonds and rely on social information for survival in the wild, whether it’s information about the location of food or how to best obtain the food. This social transfer of information is a subject I am very interested in investigating in the future. Like all elephant species, both western lowland gorillas and chimpanzees are endangered species, so their conservation is of utmost importance. To support ape conservation, the Fisher Center has a field research site in the Goualougo Triangle of the Republic of Congo, a remote area where chimpanzees and gorillas live side by side. The Goualougo Triangle Ape Project has many aims including investigating the impact of human encroachment on these endangered apes and the unique types of tool-use seen in the chimpanzee population. 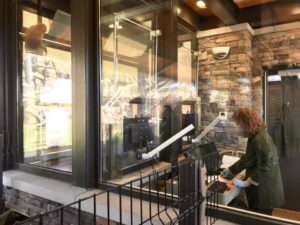 One of my roles with this project was to screen video footage of these chimpanzees and gorillas, and share videos of their behavior with the general public. I valued this opportunity to encourage public interest and help support the project’s mission to conserve these species. While working for Think Elephants, I created similar educational content to engage the public in elephant conservation. Both elephants and apes are charismatic species, but the more people can see the similarities between themselves and these species and empathize with them, the more likely they will be to support conservation. I have enjoyed working at Lincoln Park Zoo for many of the same reasons I enjoyed working with Think Elephants International. Both organizations focus on scientific research not only for the sake of knowledge, but also using this research to educate the public and conserve the species that we are studying. I hope to maintain this focus in my future career and promote the connection between people and wildlife. After working with primates for the past three years, I’m returning to focus on elephants. I will be again working with Dr. Joshua Plotnik (Think Elephants’ Executive Director), this time as his PhD student at the City University of New York Graduate Center. We will be starting a project investigating the intersection between behavior and conservation of wild elephants in Thailand. We also hope to conduct cognitive studies with these wild elephants in the field. I know the skills I’ve gained while working with the primates will be beneficial as I begin graduate school and return to thinking like an elephant. With Da and Pumpui, two elephants who were our subjects for cognition studies when I was a research assistant at Think Elephants. “Riiap Raawy” for Elephant Research! Education Formulation – Over 600 Students and Counting! The Elephant’s Perspective – Our Blog is Back!